Folks often ask me if traffic exchanges work. The answer is “no”. Just like hammers don’t work, saws don’t work … tools don’t do the work. WE work. We use tools like advertising, autoresponders, and traffic exchanges to help us do our work better. This article focuses on getting results from traffic exchanges. I use a number of Traffic Exchanges and advertising sites in my promotional strategy. This article is going to focus on results I got from using EasyHits4U and how I test, tweak, and modify things along the way. My strategy for this particular campaign is to set up a text ad that goes to a quick ad page. That ad page has a headline, some ad copy, and a call to action that is linked to my capture page. 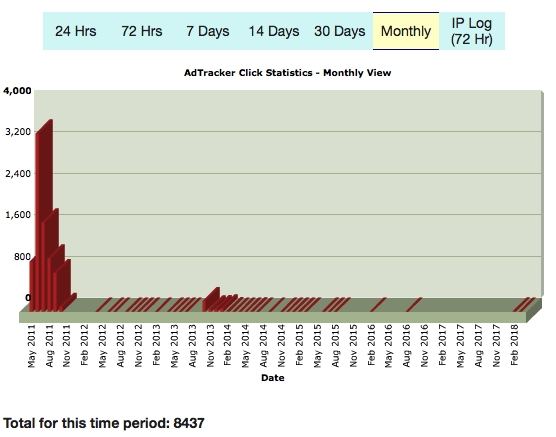 That link uses an AdTracker so that I can tell how many people clicked from the ad through to my actual capture page. Ad Copy: My Free Report Gives You ALL The Details and I WILL PAY TO GET YOU STARTED! Just request free details and let’s get you moving, today! Let’s break down the content. The headline specifically calls out to EasyHits4U Members because I am running this ad on EasyHits4U and I wanted to give myself a bit of an advantage. Members are clicking my links to get credits. They are not necessarily interested in my offer at this point. My headline calls them by something they will be familiar with (EasyHits4U Members) and then gives them what I hope will be a compelling offer: Earn Five Figures Online. I offer them a free report. I offer a few enticing (I hope) lines of what to expect and how to get the information. I have a clear Call To Action (“Click Here For Free Details”). 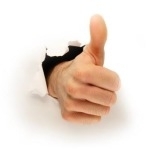 I set up a text ad at EasyHits4U. That ad links to my actual ad page. That ad page links to my capture page via an AdTracker. I already know people are going to click the text ad. They are on a traffic exchange. Most of them are going to close their page after they click. But some of them are going to want to know more about my offer so they are going to click through to my capture page. I want to track how many click through from the ad page to the capture page. When I first ran this campaign (way back in 2011), I got thousands of click throughs to my capture page. As you can see, my click throughs dropped considerably. The average person would look at this and say, “Traffic Exchanges Don’t Work”. They would probably quit. I know that my campaign worked GREAT for a number of months. I just got distracted with other campaigns and other priorities. 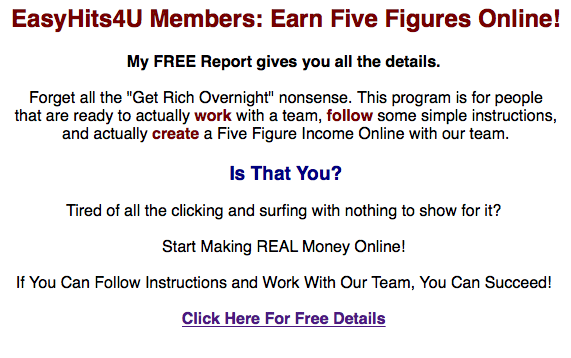 Ad Headline: Do You Really Want To Build a 5 Figure Income? Ad Copy: I Can Show You How! My Free Report Gives You ALL The Details and I WILL PAY TO GET YOU STARTED! Just request free details and let’s get you moving, today! When they click the “Click Here For Free Details” link, they will be taken to my capture page which I haven’t changed yet. Will this work better? I don’t really know and won’t know until I see a lot more traffic coming to the ad itself. The AdTracker will let me know how many click through to my capture page and my capture page will let he know how many subscribers I get. I am advertising my capture page so I can build my list. I am tracking my results so that I know what works and can make the necessary adjustments. Even when I let things slide (which I did), I can log in and make the adjustments and get things moving again. How are you doing with getting results from traffic exchanges? Have you tracked your results? Have you made any changes lately? Let us know in the comments, below. Great post. Extremely helpful. After reading it I have finally understood what changes should I apply to my own campaign. Thanks! Just one question – after people click “Click Here” does your capture page open in the same window? Yes. My capture page opens in the same window. No need to risk a pop up blocker taking me out of the race. I am just starting to advertise TOAN on safelists and traffic exchanges. I didn’t seem to get much interest in my organic health supplements business with safelists and traffic exchanges. Maybe I just didn’t use enough of them. Health supplements can be a tough sell via TE’s. Were you promoting a capture page that offered some big enticements or just advertising the sales/copy page? On the other hand, advertising business tools like advertising, autoresponders, etc… on TE’s makes sense since everybody on a TE is looking for ways to build their business.